The model provides guidance for preparing program evaluations, which provides the following: (1) A mechanism for the agency to address the condition of and specific regulatory concerns about regulated industry and products; (2) Provides for risk-based utilization of CFSAN and Office of Regulatory Affairs (ORA) field resources; (3) Furnishes the information necessary to develop or support regulations, policies, regulatory strategies, and industry and consumer outreach activities; (4) Provide a feedback mechanism for modifying, improving, and maintaining the quality of compliance programs and field assignments; (5) Provides an information source on FDA program area activities to an interested public. The model provides general instructions, content, and format guidance for preparing CFSAN program evaluations. The model identifies “Program Design and Methodology” as a required heading and discussion topic for each program evaluation. 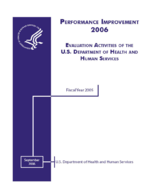 This section of the evaluation should describe the program requirements, indicate the method used for evaluation of the program area, (including the risk prioritization model that will be used, the type of data that will be collected, the data sources, and how the data will be analyzed), and indicate data and information sources used for the evaluation. The model identifies “Results” or “Findings” as a required heading and discussion topic for each program evaluation. This section of the evaluation should indicate the findings and use tables and figures to demonstrate support for each finding as appropriate. It also should include a summary of risks associated with the industry or with products covered by the program. The model identifies “Recommendations” as a required heading and discussion topic for each program evaluation. Recommendations for activities that are necessary to achieve the program objective or that will enhance CFSAN’s ability to determine progress toward achieving the program objective should be addressed in this section of each program evaluation.